We are a young organisation born in August 2014 with the intention that one day locals can harvest, cook with shared recipes and then eat produce from the fruit trees they planted with their own hands. 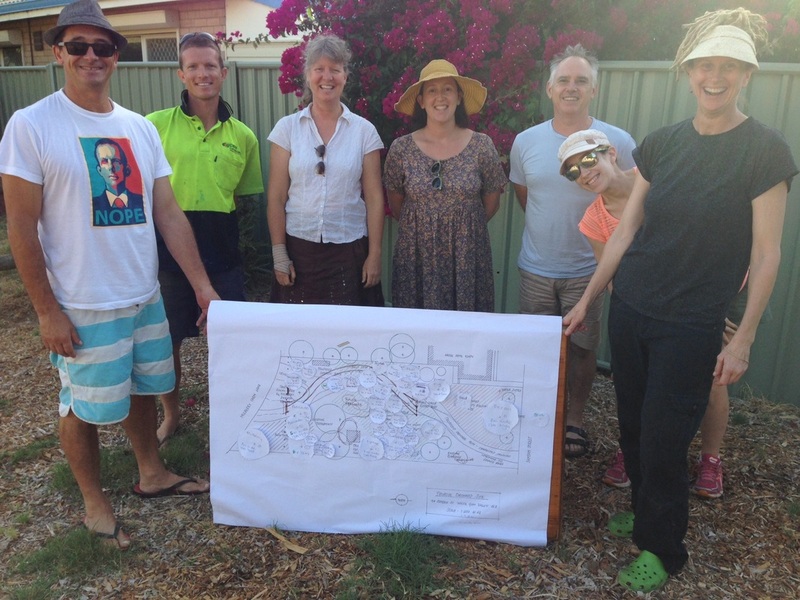 Our site is in the heart of White Gum Valley, Fremantle, adjacent to Hazel Orme Kindergarten. In October 2017 we celebrated 3 years onsite and almost all our orchard in the ground and enjoying our first harvest of bananas! To become a member, go to signup and be a foundation member! To find out more about our full vision, view our Youtube video and explore this website or Facebook (White Gum Valley Community Orchard). Want to see our Concept Plan? Anyone ever tried a fruit from the Davidson's Plum?! We look forward to taste testing it along with some white sapotes, mangoes, midyim berries, plums, macadamias...to name but a few of the many fruits and nuts we are now growing in the orchard, moving closer to our dream of community harvests of, and culinary gatherings centred on, the produce we grow through the seasons. In January 2015, our skilled orchard member Zoe Williamson, led a workshop with the committee and interested members to design the placement of all our future trees according to sun, water and space requirements. The resulting concept plan isn't set in stone though. Our tree list will change over time as we learn more from each other and the saplings' success or otherwise. In October 2016 we planted our citrus grove and this marked a significant point in the establishment of the orchard, with the majority of trees now in the ground. In the summer of 2016-17 the first harvests began with bananas and tamarillos. We are picking on verges in the Valley on Saturday 6th and then moving to Booyeembara on Sunday morning. Register as a picker and we'll give you up to date information...and pickers will receive a portion of fresh local olive oil at cost price. Register here. More information on good olives and harvest here. It has taken a while for the many hands of Cavendish bananas to ripen but they are finally turning yellow as the summer wears on and tasting good. We also have a small crop of figs on our Blue Jenny fig. We have a policy of if you give a little to the Orchard, then feel free to enjoy its fruits as they ripen. If you're not a member yet, sign up here or on our mailing list for busy bees and other events, email us. A successful partnership between the orchard and Hazel Orme Kindergarten saw the Orchard buzzing with live music, whip cracking entertainment, fire truck visit, a nature mosaic and a great turnip of locals. In addition to our new banner, the shed shutters and doors adorned with artwork. We celebrated over a delicious sweets table in the shade of the banana grove and then got into some watering, weeding, pruning and understory planting. In 2017 we pressed 40Litres of oil and in 2018 with very ripe olives picked we had maximum oil content and 90Litres pressed and bottles for pickers and locals. 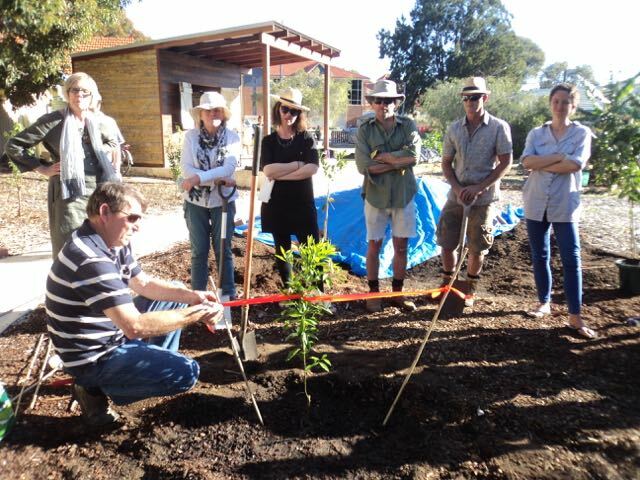 We had a great Citrus Workshop, thanks to Peter Coppin and all of you who attended. 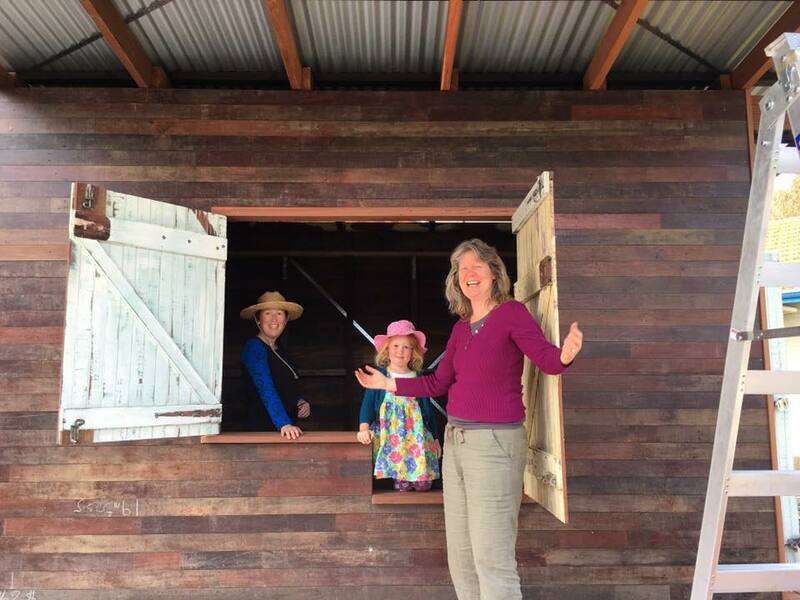 Our beautiful timber shed is complete. It will be principally for storage, while the generous verandah will provide us with shelter and enjoyment. We acknowledge Aboriginal and Torres Strait Islander people (particularly the 'Whatjuk people of the Noongar nation) as the traditional custodians of this country and its waters. We wish to pay respects to the elders past and present and extend this to all Aboriginal people.